It's an exciting time for broadcasters. With the proliferation of streaming video, OTT devices, connected TVs and mobile devices, the line between offline and digital video is quickly blurring. Navigating this change, though, is tricky--broadcasters are now facing the challenge of how to manage an ads business that spans multiple devices and multiple ways of consuming content. We’ve been working on a few initiatives to help broadcasters with this challenge, I had the pleasure of introducing a few of these at the NAB Show this morning. One of the biggest challenges broadcasters face in this new landscape is accurately being able to forecast their inventory for their shows. What was once a fairly straightforward process--estimating how many ads they could show during a given program though one delivery method on one screen--now looks like a logic puzzle on steroids. To help them meet this challenge, we're introducing new ways for broadcasters to forecast in DoubleClick for Publishers by enabling them to forecast available internet TV inventory with greater precision and insights and the impact from patterns in commercial breaks. And coming soon, broadcasters will be able to use seasonality in forecasting for upfront cycles and model based on their offline data. Our goal with these changes is to make it easier for our broadcast partners to manage this process and put together great inventory packages for their upfront offerings. 'With more and more of our viewers consuming content across screens, digital video is, of course, a huge focus. Google bringing the mDialog technology to the DoubleClick Ad Exchange has allowed us to connect our Internet-delivered television content, whether live programming or full-episode shows with the controls we need to programmatic demand. This is a great step forward both towards being able to better monetize this cross-screen content and providing a great ads experience for viewers. We're excited to see where this goes." We're experimenting with additional models, like linear TV, as well. As just one example, we're running trials of addressable ads into linear TV set-top boxes via our Google Fiber service in Kansas City. Powered by DoubleClick technology, we are helping local businesses connect with customers in that market by delivering more relevant messages to viewers. In our ongoing DoubleClick series on the Evolution of TV, we've been discussing the risks and opportunities around 7 dynamics transforming the advertising landscape. 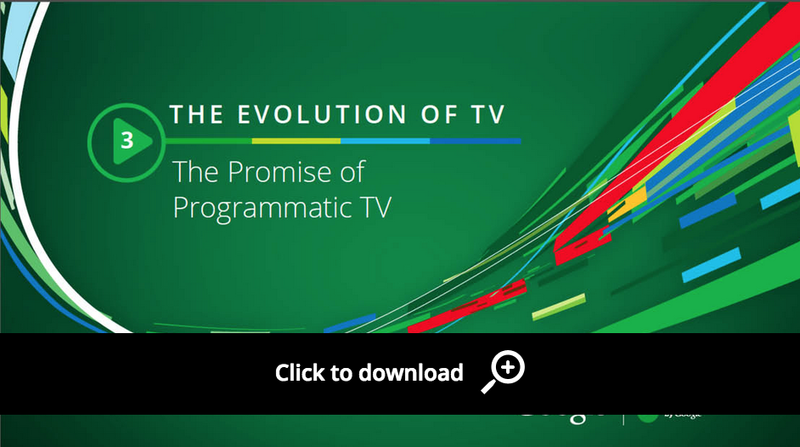 In Part 3 in our Evolution of TV series (find the rest of the series here) we dispel the hype about programmatic TV, address the challenges, and concentrate on its promise for brand advertisers, programmers, and broadcasters. Ultimately delivering addressable ads whether across TV ads served via the internet or through the set-top box is about delighting users with the best viewing experience. It's a technology that everyone in the industry can get behind. Advertisers have always wanted the customization, programmers and distributors have always wanted it to maximize the value of every impression and viewers appreciate more relevant ads. Addressable TV is a win-win-win proposition.